This recipe came from my Mom who was a fabulous cook. She always grew a lot of rhubarb and loved to bake with it. This is really not to sweet or too sour, it is really delicious. I like to serve this a little warm with whipped cream or ice cream on top. Combine 2 cups flour, powdered sugar and butter. Mix well and press into a greased 9″ x 13″ pan. Bake at 350 degrees until golden brown, 10 to 15 minutes. Beat eggs, sugar, 1/2 cup flour and salt until well blended. Add rhubarb; mix. Spoon mixture onto baked crust. Bake at 350 degrees for 45 minutes more. Cool and cut into bars. This sounds very good. Do you think that gluten free flour could be used? I really miss my rhubarb recipes. I’ve done it gluten free, the only issue I had was it got soggy faster. No one at the party new it was gf. This is a staple at all family gatherings and passed! Sure a blend of different gluten free flours would work fine. Of the gluten-free recipes that I have made, I have used “Cup 4 Cup” Gluten Free flour. You are supposed to use it as you would use regular flour. I made some things to take to my Bible study as I had a friend that needed gluten-free. It turned out delicious and everyone loved it. I am also going to try it gluten-free. I’ll just have to eat it if it doesn’t turn out. Thank you for the information regarding gluten free. I really suffer if I cheat. I made brownies for my son on Fathers Day, usng all purpose flour. It wasn’t worth the pain I suffered! Of course, all the more for him. LOL! sounds good, , will try.. greetings to you all, we are doing quite well for “older” people.still in our home and can drive!!!! Can’t wait to try this recipe. 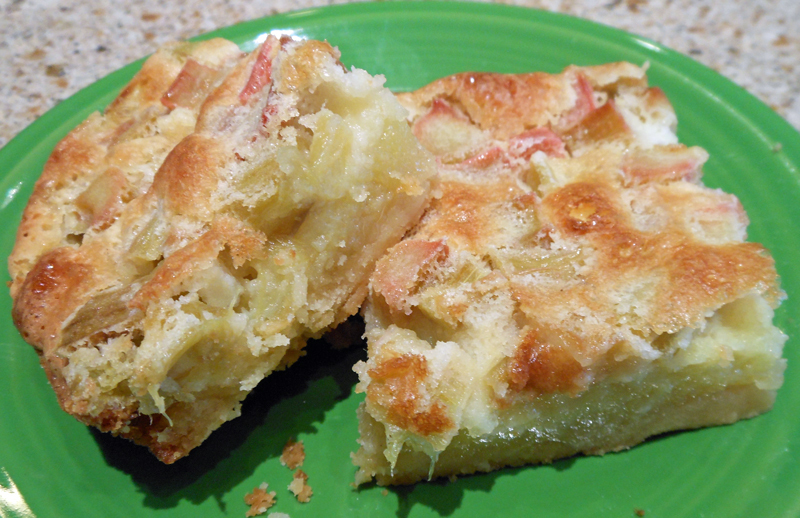 The picture with this recipe shows a crust on the top. Do you reserve some of the bottom crust and use on the top? No, I didn’t put a crust on top. The egg mixture will rise and make a meringue-like topping. Don’t save out any of the crust for the top. The nars are divine, and easy to make! My egg mixture didn’t make a meringue like topping. Did you separate and beat the egg whites first. Didn’t take away from the flavor but don’t look anywhere near what’s in the picture. I think the receipt might need some tweaking based on some of the other comments and the responses. Love rhubarb!!!!! just made them and they are great!! Darlene, did you put a crust on the top? The mixture that goes on the top would be the thin crust shown in picture. Read the response above from dixieskitchen…there is no Crust on top! The ingredients you mix in the second part will brown up and act as a crust. Just follow the recipe and it will work out…you will see. I put a 1/4 tsp of guar gum to each cup of gluten free flour. Seems to make it more like you had used real flour… I think it just looks like a crust on top but is just the browned rhubarb.. I have to try it soon…. Sure, not a problem. I use frozen most of the time when I don’t have fresh in the Spring. I always wondered, if using frozen rhubarb, you must thaw and drain, right? Pat, I don’t thaw rhubarb first. Use it as fresh right from frozen state. I freeze my rhubarb as soon as it’s ready since it has such a short season here, then use it in place of fresh in everything that gets cooked or baked. Highlight the text that you want, select print, and then in the printer window instead of print all, change the setting to print “selection.” Hope this helps. Try printfriendly.com Download for your browser, you can delete what you don’t want to printl. These bars are DELICIOUS!! Everyone who tried them LOVED them!! Whenever my mother made anything with rhubarb she would add just a little ground ginger it would take that bitterness and grittyness out of the rhubarb. I would suggest 1/8 to 1/4 tsp ground ginger. I haven’t made this yet but when I do I will add some ground ginger to it. This recipe calls for all-purpose flour. I have never had this turn out sour or bitter. But I suppose it all depends on the rhubarb. You should try it. I think you’ll see why they are called dream bars. Enjoy! these look great…just a question, do you cook the rhubarb first ? You do not need to cook the rhubarb first. This top is way too salty. I think the salt was supposed to be sugar. Almost unedable. I agree didn’t like the salt. I have another recipe similar and doesn’t have salt they taste much better. will leave out salt next time I make them. Because of the tartness of the Rhubarb no salt is even needed!! delicious without!! Can I freeze these squares? You sure can. Just wrap each square in plastic wrap and then put them in a plastic bag and freeze. This was excellent and really easy to make! The only change I made was to add a few good shakes of cinnamon to the topping mixture and chopped a few frozen strawberries in as well. Made as recipe says, then, read comments as it is baking. And thought, Oh no! Too salty! I hope not. Someone else commented cinnamon on top might be good. I thought it, but didn’t do it. So, I added sugar and cinnamon mix to the top after baking. Looks and smells delicious, but too hot at the moment to eat. Looking forward to tasting. 8 ounces in one cup. Will have to make some powdered/confectioners/icing sugar to make this. Can be done with Splenda and corn flour/starch in a blender. Just whiz quickly. I’m not really sure I will try the Rhubarb Bars, but I printed it, after printing 5 pages, that was ridiculous and the 1 C of butter sounds like a lot, didn’t say if to melt, softened or keep cold? I thing I’ll stick to my upside down Rhubarb, safer. I didn’t melt the butter. I put everything in the food processor and mixed to fine crumbs. You might want to chunk up your butter and then put it in the processor. Or you can use a pastry blender if you don’t have a food processor. So you had the butter softened at room temperature? The recipe did not say whether to soften or not. I assumed by one of her posts that she mixed it like a pie crust with unsoftened butter. ? Do you cool the baked base before you add the batter? I really want to try this. No, you don’t need to cool them off before adding the batter. The rhubarb dream bars sound really good. I’ve made these for years from my grandmothers recipe. The only thing I would suggest doing differently is after the crust is baked, spread the rhubarb on the crust and THEN pour your custard mix over the top of the rhubarb. If you do it in that order you should get a fine crisp sugar crust over the top of your bars! (That’s how my grandmas always was and it took me several tries before realizing she didn’t mix the rhubarb with the custard lol) best of luck! sure glad u shared your wisdom as lots of cooks and bakers did not have mom’s or grandmoms to teach them the right way to cook and bake. Thank God my mom taught me how to do both. Tried this with adding 1 cup blueberries to the rhubarb… Total hit at the potluck and many people asked for the recipe. Thanks so much!! What kind of gluten free flour is a good tasting one? I use Cup 4 Cup. You would never know it was gluten free. Love this recipe. My grandma had a very similar one and it was always a hit. made these bars and they were great. the only problem the edges were very hard. How would a meringue do on these bars? I added a little nutmeg! Delicious! Can one halve the recipe, I live alone and small apartment. Sure, I don’t know why not. You may not need to bake it quite as long in a smaller pan. So I cooked it for 45 more minutes but when I took it out the middle was still not cooked. It was very liquidy. What did I do wrong? I’m cooking it for a little longer right now to see if that’ll work. Do you have to refridgerated leftovers? Can it be left at room temperature? No, it is not necessary to refrigerate. Just wondered if the 11/2 tsp. Salt should be baking powder instead.Have made a lot of bars & most have baking powder in them. Tks. No, there is no baking powder in these bars. Spring is here in Central Minnesota but still to cold for the rhubarb plant to produce. Good thing I chopped and froze rhubarb last summer. After reading all these posts I think I’ll skip the salt, spread rhubarb on baked bottom and then pour egg mixture. Hopefully it will work out. Did it work out better by spreading the rhubarb on the baked bottom? Just made these and they turned out wonderful. Very easy to make. I followed the recipe and also the suggestion to put first ingredients in the food processor. I did only add 1 tsp. salt to help with my sodium intake. Thank you Dixie’s Kitchen for sharing, I would make this recipe again. We have a glut of plums right now, so I think I might try it with those! They are pretty tart. It looks really good, but I can’t post a picture here. Haven’t tasted it yet!! What is the recipe for “Cup 4 Cup”gluten free flour? I would like to try this recipe with gluten free flour. I tried to print this recipe…..oh my gosh, got so many pages of All the comments, ran out of paper. I’m sure when I refill paper, it will still be running cause never got the recipe!! What’s up with that?? OMG these are GOOD! SO easy to make…after I just slaved over a homemade crusted custard pie; these are much faster and yummy too. Took the entire 9″X13″ pan to a church picnic…and only came home w/ 2 small bars!! Guess it was a hit!! Thanks for sharing this…I’ve already copied the recipe for a friend and I’ll be making them again!! I used coconut flour instead of all purpose and used truvia granulated sugar instead of regular granulated sugar, added starwberries=turned out amazing and has less carbs than using the ingredients the recipe calls for.